THIS IS PURE FICTION, FICTION, FICTION! Thanks to all for writing in with comments concerning this fictitious satire. This post was written to take a poke at the Small Woodland Owners Association of Maine (SWOAM), one of the opponents to opening hunting in Maine on Sunday. In the last legislative session, they worked tirelessly with other small interest groups, to kill the bill that would have allowed Sunday hunting in Maine. In the process, they sealed Maine’s fate, ensuring it stay the absolute worst state in the nation for small business. Guide companies, ATV dealerships, L.L.Bean, Cabelas, gas stations, Ma and Pa Groceries, hotels, motels, inns (the list goes on and on) all suffer because of a outdated blue law we are apparently to ignorant to correct. Does it make sense to ban cutting wood on Sunday? Hell no! Does it make sense to continue to ban hunting on Sunday . . . sorry to cut this explanation short but I am off to New Hampshire to hunt coyotes and spend my money outta state! Bye! Please join in supporting Proposed Public Law 182.b, “A Statewide Ban of all Tree Harvesting on Sunday”. This law would effectively ban all logging, transport of logs, cutting, felling, de-limbing, tipping and chainsaw activity within the state of Maine boundaries on Sunday. The laws main focus and purpose is to protect Maine’s forests and woodland animals from the current continued and uninterrupted abuse put forth by both large enterprise level log harvesting companies, self employed pseudo-independent harvesting firms and small independent wood lot owners. It is critical for the health and well being of Maine’s ecosystem and its people that at least one day a week exists when the woods are not molested by these intrusive and destructive logging operations. Providing one day a week, devoid of tree harvesting, will allow a break in the continued cycle of assault put forth against Mother Nature, allowing displaced woodland animals a chance to reunite with broken family groups, nesting birds an opportunity to relocate and stressed rare insects, annelids and avifauna ample time to recover from the excessively raucous tree cutting operations and practices. The basic tenants of the law would not only provide support for Maine’s ecology but also economy. Currently, these operations pose a significant and dangerous threat to hikers, backpackers, fishermen and bird watchers. Careless loggers are often intoxicated and pay little if any attention to where the trees are falling and have been know on occasion to injure people with their reckless conduct. Having a special day of the week when one could walk through the Maine woods without having to worry about being killed by a logging truck or hearing the ear damaging and disturbing sounds of chainsaws, skidders, cutter/fellers, etc. would allow Maine to be unique among the other states. The tourism industry would be provided with a significant boost, as our place as a national leader in ecotourism would be heightened by our progressive measures to support the natural balance of our state. To re-state the above tenants, banning logging on Sunday will enrich Maine’s tourism industry, eliminate a potentially dangerous and threatening environment from our woodlands, provide critical support for native animals and allow wellbeing to return to our dying forests and depressed populations of woodland animals. Please join me in taking the fight to Augusta as PL182.b is presented to the joint legislative inland fisheries and wildlife committee next month!! With the amount of forests up there I am sure some of these companies can afford to take one day off. I think this is a great idea for all the reasons you have stated. I wish Montana would pass something like that too. If I was a citizen of Maine, I'd help, but I'm not. Good luck with it. And please post the results. I don't agree with this at all. Private land owners should be able to manage their woods on Sundays. I might be ok with it if it pertained only to logging companies, but for someone who works all week, Sunday might be the only day to cut firewood to keep his family warm. Perhaps it could effect only lots above a certain size, to minimize the impact on individuals. I would not support a unanimous ban however. What a completely terrible idea. I often take perverse delight in pointing out to Plum Creek protesters the actions that got them there. The forest industry is one of the few that has a vested economic interest in lots of forest -- with a reasonable rate of return. Also, if you use the "bad apples" argument, you create a great basis for completely banning hunting, fishing, boating and hiking. The "bad apples" in those pastimes certainly creat their share of property damage, injury, cost and death. So let's ban that too. Thanks to all for writing in with comments concerning this fictitious satire. This story was written to take a poke at the Small Woodland Owners Association of Maine (SWOAM), one of the opponents to opening hunting in Maine on Sunday. In the last legislative session, they worked tirelessly with other small interest groups, to kill the bill that would have allowed Sunday hunting in Maine. In the process, they sealed Maine’s fate, ensuring it stay the absolute worst state in the nation for small business. Guide companies, ATV dealerships, L.L.Bean, Cabelas, gas stations, Ma and Pa Groceries, hotels, motels, inns (the list goes on and on) all suffer because of a outdated blue law we are apparently to ignorant to correct. Well, sorry to cut this explanation short but I am off to New Hampshire to hunt coyotes and spend my money outta state! Bye! Renee . . . lol . . . yes, you can still use your gator! RK and KT . . . EXACTLY! Da heck with SWOAM and anyone else who dare oppose Sunday hunting! Eric, "For somebody who works all week Sunday might be their only day to . . . hunt." I assume you see where I am coming from. Anon. Here in Maine there is already a ban on Sunday hunting. I agree with you . . . nothing should be banned on Sunday. Thanks again all for commenting! interesting read. So where do I fit. I am a Pastor who has a degree in Forestry from Stephen F. Austin in Texas, now pastoring in California. Sunday afternoons after church in the woods, hunt'n, fish'n, shoot'n and cut'n wood is very relaxing. This is so wrong on so many levels its scary and those who have commented that this would be a good idea are even scarier. Do you think for yourselves or do you just tag along for the ride? Try getting a grip on reality. Drunk loggers dropping trees on people are you kidding me. How many news reports have you seen about this terrible problem of dead fisherman and bird watchers being crushed by trees in the news? None of course. It has great dramatic value in the story though doesn’t it even though there’s no truth to it. Most tree harvesting is done with harvesters today. Trees are cut and precisely laid with a hydraulic arm in large piles to be moved to the wood yard. Give mother nature a day off and the poor little animals? Does old man winter do that? I live in Northern Maine. Most logging operations don’t work on Saturday or Sunday. Also logging operations are shut down in the spring for two or three months because the roads and woods are to soft to cut or haul wood. That’s up to 90 days for “Mother Nature and the animals to recover a year . There’s only 52 Sundays a year and we won’t even get into break downs and so on which shut down logging operations. Get a grip people. This would be is a waste of legislative time and paper I might add. These All Gore wannabees should be ignored. You make a lot of excellent points in your post. Now twist your thoughts around to the current MAINE law that doesn't allow hunting on Sunday and I think you will find it is EQUALLY stupid. Check the first paragraph and see my explanation of why I wrote this fictitious post. Obviously, Anonymous, is one of those people who think only their opinion matters. For you information, Anonymous, some of us enjoy time in the woods without hearing an obnoxious chain saw running or dealing with logging trucks barreling down a narrow mountain road. I live in Montana where this is not uncommon. YOU DO NOT. I pay my taxes, I have worked all my life and so has my husband. We are entitled to a little piece and quiet ONE day a week. That is the reason we live in Montana. There are more people who live here for the beauty and peacefulness, than the people who live here to log. We have bikers, hikers, walkers, bird watchers, animal lovers and photographers and writers. THEY all disagree with YOU. So, I am thankful YOU live in Maine. Please stay there. Just because you do not agree, does not mean we do not think for ourselves. That is an ignorant and arrogant notion. Only those who have run out of intelligent ideas, feel the need to name call, as you did AND sign anonymously. This is obviously an emotionally charged issue. Everyone feels like they are on the right side of the argument. 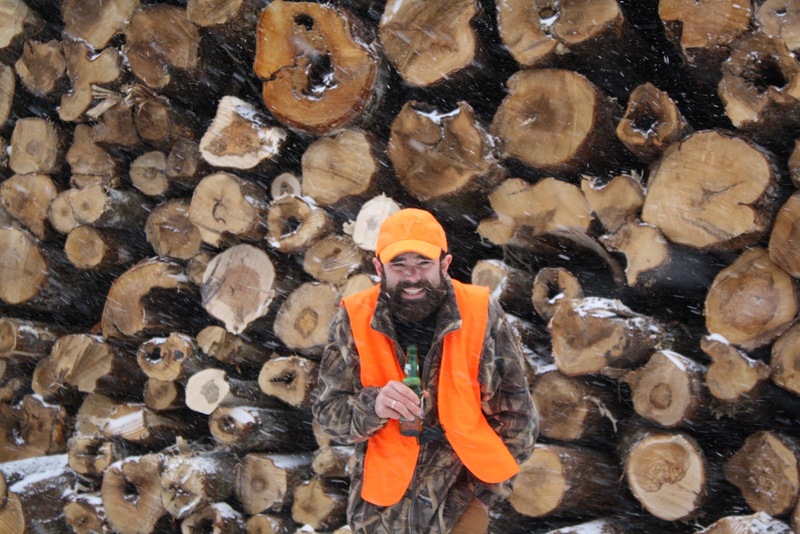 I am certainly passionate about the state of Maine lifting the current ban on Sunday hunting as much as a logger would be about a BAN on Sunday tree cutting. Perhaps my hoax pointed this out and perhaps it didn't . . . Sorry it took me so long to post everyone's comments! I just got back from a solid week of ice fishing and wasn't anywhere near an internet connection . . . thank God! Well back to the grind, lunch break is almost over! Most of your stories of duck hunting are a loosely woven string of bad lies, fiction and half truths. Not to mention you swear like a pirate and stink of the sea. See, telling the truth and being factual isn't so hard is it? maine already has bad game management ,and extremely low deer, rabbit, grouse, etc. populations. the season is far too long for the deer herd population we have now. the season should be 1 week and 1 only, after a year or 2 of no hunting to give a chance to re-populate. sunday hunting? sure, if we had the game to hunt. coyotes can be hunted all year except sundays, this should be the only exception! I agree with your controls on hunting related to deer, however, coyotes, gray squirrels, red squirrels, rabbits, ducks, bobcats, raccoons and bear all have populations that could support Sunday hunting. That's probably for the good of our environment. I think it's a great idea.